Bedphones are headphones for sleeping—they’re specially designed to listen to while in bed. 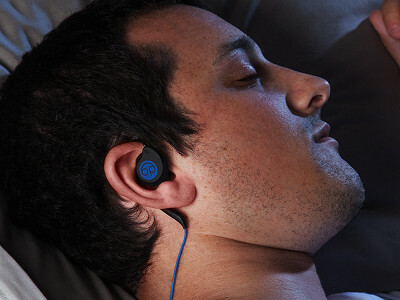 Less than a quarter-inch thick, these on-ear headphones practically disappear between your ear and the pillow. Soft and foam-covered, the earhooks are made from rubber-coated memory wire that you custom fit to your ears. Bedphones are at home on your nightstand, but you can take them anywhere else, too. They fit securely, so wear them on active pursuits or at the office. There’s even an optional inline microphone to take calls and a way to control your music without touching your phone. To reduce any extra bulk, Bedphones don’t have extra features like Bluetooth or high-fidelity sound—they’re made to be as light and comfortable as possible. Just be sure to wear them with the cord around the back of your head for sleeping. Packaged with a travel case and a sleep mask, we think of it as bedtime in a box. Hello everyone! I'm proud to introduce Bedphones to The Grommet. I'd be happy to answer any questions you have! These are incredibly cool. I will likely be getting them immediately. What gave you the idea for Bedphones? Was developing a business around it an ‘aha’ moment or more of a gradual process? Eric actually tabled the idea for a few years and went to work as a nuclear submarine propulsion engineer for a major defense contractor. He slowly started to realize that he wanted to start his own business, and then the idea of these sleep headphones popped back into his head and he started working on it right away. I'm fairly certain he is the first person in history to make the 'nuclear submarine propulsion to headphone' career switch. Very impressive! @Mike I wondering if these can be worn all night to listen to white noise? Does it turn off at some point or can I listen to it until I wake up? I have a white now that is wonderful, but not so convenient to pack up & take with me while traveling. Hi Kristina, if you download the Bedphones Music Controller App on the Bedphones site, it will shut your music off automatically when you fall asleep. What do you see as the advantages in using Bedphones compared to traditional headphones? Traditional headphones are too thick to wear to bed. When you roll on to your side, traditional over-ear headphones put too much pressure on your head, on-ear headphones put too much pressure on your ear cartilage, and in-ear/earbud headphones put too much pressure on your ear canal. Furthermore, many people find in-ear headphones uncomfortable due to the shape of their ear canal and itchiness from silicone earbud tips. At less than ¼” thick, Bedphones allow you to listen to your favorite music/meditation/white noise/nature sounds, etc. from the comfort of your bed. Relaxing sound is a proven method to fall asleep faster and stay asleep longer, resulting in a happier and healthier lifestyle. @Steph I wish I'd known about these a few months ago! I was actively searching for more comfortable bed time earphones and couldn't find anything. For over a year I listen to different sleep programs and/or hypnosis programs at bedtime. I have to fall asleep on my back (which I HATE) because all of the headphones will press so hard on my ears it really hurts. But I finally did find an in ear style that works. However, I do still wake up at some point, pull them out and roll over to my side. I hate being woken up like that so I hope at some time in the future I can go ahead and get these. Unfortunately, they aren't in my budget right now. What I DO want to know though is --- how does the quality of the sound compare to in ear buds??? This is very very important to me. I want full, deep, enveloping sound that does block out other noises in the room. I want to feel very connected to whatever I'm listening to. Can you tell me how they compare in sound quality (even though I know that is somewhat subjective). Thank you. Hey Allyson - I'm happy to comment on the sound quality. Bedphones are manufactured with a custom 23mm driver. As a result, sound isn't sacrificed for comfort. I use them as my everyday headphone, for phone conversations, and for podcasts, and find that all of these uses sound very similar to other headphones. Obviously, Bedphones can' compare to audiophile type headphones in terms of sound quality (headphones costing several hundred dollars per pair). Bedphones can cover up most noise, but because of their design, they don't completely block out louder ambient noise. They lay flat against the ear, so they aren't noise canceling. I do find, however, that they eliminate softer nighttime noise (traffic on the busy street outside of my window, my a/c unit, my snoring boyfriend, etc). This may be a boon to people with Tinnitus or other hearing difficulities! A report launched today about the health dangers of using ear-bud technologies. There are other sleep-phone products on the market, with a broader price range and non-invasive design. How do the Bedphones compare in sound and safety? @Karen Hi Karen - Bedphones are extremely competitive with other related sleep products on the market. Personally, my favorite Bedphones features are their sleek design and great sound, both of which are unmatched by other products in this product category. While they are designed to be comfortable in bed, they have quickly become my everyday headphone. Earbuds hurt my ear canal, and over-the-ear headphones mess up my hair (I have a pixie cut that is easily creased by over-the-ear headphones). Bedphones are slim, sleek, comfortable, and unlike other products in the sleep market, I can confidently wear them while commuting, at the office, and in airports and train stations, without feeling silly. As for their safety, Bedphones are as safe or safer than other ear-buds because they don't enter the ear canal. However, I'd need to read the specific report you cite to be able to comment on their safety in a specific context. @Steph I have the exact same concerns. @Steph I would also be interested in the safety of leaving a phone or ipod in the bed with you! I've heard of near fatal disasters from them getting too hot and igniting the bedding! and if you roll over won't you get tangled in the cords even with wearing them in the back. Wish they were Bluetooth!!! Hey Chari - ignited bedding sounds really scary! I have not heard of anything like that happening, and I'm sure it has much more to do with phone design than anything else. Unfortunately, we can't do anything about flaming bedding at the time, though I wish we could. I have never been tangled in my Bedphones cord, nor have I heard of any customer dealing with this as a recurring issue. Because of their size, a Bluetooth headphone would still require some kind of receiver to be wrapped around your neck, which would likely be even more dangerous than a long, thin cord behind your head! We thought that a wired option was much safer than intentionally sleeping with a cord around your neck. Hi Chari, it's a great question. The danger comes in completely covering the devices by putting them under a pillow or sheet. If there is airflow surrounding the phone or music player, you should be ok. Maybe putting something between your phone and bedding will help. When it comes to getting tangled, it really depends on you as a sleeper. If you toss and turn enough, you can get tangled in just about anything. But because Bedphones go behind your head, they can help limit tangling overall. I have a granddaughter who has trouble sleeping. She is away at college and she is going to turn 21 in a week. So this would be perfect for her. A pair of sleep earphones and a mask. The only thing is she needs to be awakened, so she can get to the places she needs to. Work and school. She is still young and like some kids, like to hang out with friends, and stays up late. Can this device do that? Hi Maria - Bedphones can be plugged into any phone or mp3 player, so if the alarm on her phone is set to wake her up at a specific time, it will sound in the Bedphones as long as they are plugged in. In addition, because Bedphones are non noise-canceling, she will be able to hear any external alarm that is in her room (a clock radio alarm, for example). Your granddaughter will be rested, on time, and ready for her day! I'm thinking, as a hearing aid wearer, that these would be perfect for everyday use with hearing aid ear molds in place. Mine are designed to admit ambient sound past the mold, and I can use over-the-ear headphones to good effect. I can't use in-ear buds because of the ear molds that preempt them. Hey Michael - I completely agree. I am sure that you'll find these comfortable to wear with your hearing aids. I'm very interested in these, but I'm also very allergic to latex. Can you tell me if there is latex in either the foam and/or the rubber coating on the earpieces? Hi Beth - though I am not 100% sure, it is likely that one or both pieces contain latex (particularly if you've found that many similar products contain latex, ie, other foam earphone covers, most plastics, etc). If you are extremely allergic, I would say to refrain from purchasing this product - we wouldn't want you to have an allergic reaction! Hi, I am wondering about my sleeping partner hearing sound from the Bedphones. Are they silent to others around the person wearing? Hey Laurie - yes, when I wear my Bedphones at night, my partner can't hear my music (even when he's big spoon!). This might depend on how loud you listen to your music, and on how quiet your room is at night. But at low-to-normal volumes, in a quiet room, they can only be heard by the wearer. Do you have any plans for a sweat resistant version (that can be used for exercising)? This is a great question, Karl! Our founder, Eric, is an avid mountain biker in the Pacific Northwest. He wears his Bedphones on 20+ mile rides all the time. I commute in Washington, D.C. with my Bedphones on, and we both love that we can hear ambient noise while riding. I can hear traffic, and Eric can hear his friends as they call out directions. They also stay in place very well (even during my daily yoga headstands!). The only non-sweat resistant part of Bedphones are the foam covers, and we send you two replacement pairs of foam covers with every Bedphones order. That being said, we are definitely looking into how to make these even more sweat resistant. Thanks so much for the feedback! I've very interested in these, since every pair of earbuds I've ever tried have hurt the insides of my ears. How padded is the wire that wraps behind the ear? Is it easy to manipulate to fit the shape of the ear? Thanks! Hi Melissa - we hear from a lot of people like you, that also experience pain as a result of earbuds. So fear not, you're not alone! The wire is infinitely adjustable, you can bend it as much or as little as needed to fit the curve of your ear. It is totally customizable. It really helps to use a mirror at first. It took me a few tries the first time around to get the fit just right, but now that I'm used to the motion and the fit, I can put my Bedphones on quickly and comfortably just as easily as I can slip in a pair of earbuds. Hi Steph, I would love to get these but they are a little out of my price range. Are there any plans to make a cheaper version ($30-$40)? Also, how durable are they? I've had earbuds where the cord got disconnected from the bottom of the earbud and I had to toss them. Thanks! Hey Katie - we don't have any plans at the moment to offer a cheaper version, mostly because these were custom designed, built, and patented by our founder. The price represents all the R&D that went into ensuring that they are truly comfortable enough for sleeping. As for the durability, Bedphones are very durable since they are designed for sleeping. We do a lot of destructive testing to test the boundaries of their strength, and we have made great improvements to the durability since launching in 2011. Our connections points are stronger than ever, and we're always looking for ways to improve upon the product. I think you'll find that these are more durable than your average pair of $30-$40 headphones. Sometimes, quality is worth an extra $20-30 dollars. Cheaper headphones are rarely built to last. @Steph Great! Thanks! If they really last then they are worth the price. I bought a pair of Bedphones a couple of years ago and really enjoyed them - but it didn't take long for one of the thin wires to break where it entered the ear pad. Are you using heavier wires now that can hold up without easily breaking? Sorry to hear about that, Ray! As Steph mentioned above, Bedphones are more durable (and more comfortable) than alternative earbuds that may be cheaper. If indeed you do have a problem, you can rest assured knowing Bedphones come with a one-year warranty. I have wanted some comfortable earphones for sleeping for many many years! I am so happy that somebody finally made them. I am ordering today. Hope I like them! We hope so, too, Susan! I am wondering if these would help with drowning our my husband's snoring?? They look great and if they can give me a good, restful sleep, they are worth every penny! Hi Sally, that is a tough one. It's possible they can help in blocking the noise, but Bedphones aren't noise canceling so I'm not sure they'll be effective at "drowning out" your husband's snoring. They have been found to provide a restful night's sleep though so the odds are good they will be worth every penny! I have been interested in getting a sound machine to listen to in an effort to help my sleep. I was thinking if there was one you could plug these into, that would be great. I live in a condo, and the walls are lacking enough insulation, and with the above, I could drown my neighbors out and get some good sleep. Hi Beth, if the white noise machine has a headphone jack and is close enough to your bed to not constrict you while sleeping, I think you may have found a solution! Bedphones are headphones for sleeping—they’re specially designed to listen to while in bed. Less than a quarter-inch thick, these on-ear headphones practically disappear between your ear and the pillow. Soft and foam-covered, the earhooks are made from rubber-coated memory wire that you custom fit to your ears. Bedphones are at home on your nightstand, but you can take them anywhere else, too. They fit securely, so wear them on active pursuits or at the office. There’s even an optional inline microphone to take calls and a way to control your music without touching your phone. To reduce any extra bulk, Bedphones don’t have extra features like Bluetooth or high-fidelity sound—they’re made to be as light and comfortable as possible. Just be sure to wear them with the cord around the back of your head for sleeping.